-Measures: Width: 240 cm Depth: 059 cm Height: 222 cm Weight: 1090 kg - 2 year guarantee! - Free Shipping! 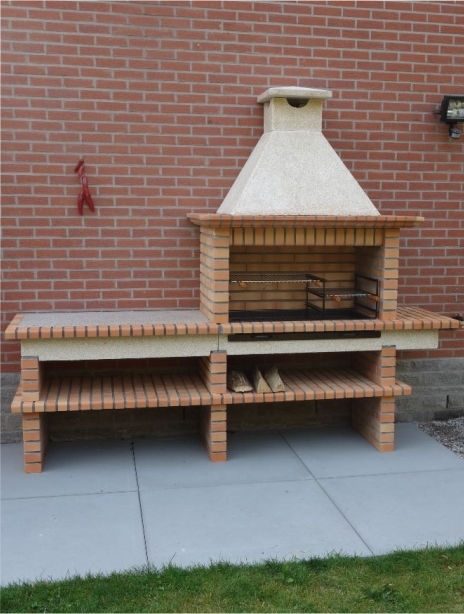 Brick Barbecues From Portugal AV336F Free shipping to England, metropolitan France*, Monaco, Belgium, Luxembourg, Italy and Spain. For other destinations pleasecontact us. Trim as much fat as possible from ribs. On bone side, work knife tip beneath membrane that covers bone until finger tips can be worked beneath rack membrane, loosening enough to get firm grip. Then peel membrane off rack. With paring knife, scrape any fat away from bone. Place ribs, bone−side−down on grill. Grill over low fire 1 1/2 hours, turning every 15 to 20 minutes, replenishing fire as necessary. Baste with apple juice at every turn during first half of cooking period either by brushing on, or simply spraying apple juice from spray bottle. If smoking with indirect heat, turn at 1 hour intervals, cooking 4 to 6 hours. Combine vinegar, onion, garlic, mustard, sugar and hot sauce in blender. Blend until smooth. Place in saucepan and add ketchup. Simmer 20 minutes.